Baby is the size of: a Cantaloupe! He's well over three pounds, but since I haven't had an ultrasound since 18 weeks I don't know his exact measurements. He feels pretty big, or at least long, in there! I feel kicks in my ribs and jabs way down low. Gender: a precious little BOY!! Symptoms: Exhaustion and constantly feeling out of breath. The nesting has also kicked in full gear. I took every last Christmas decoration down yesterday and started making room for all the baby gear that we will pull out in the coming weeks. Also worth noting, I passed my one hour glucose test a couple of weeks ago. YAY! I failed the one hour test with Charlie Beth and had to go back for the dreaded three hour test (which I passed). I was very thankful I didn't have to do that again this time around. Labor Signs: Lots and lots (and lots) of Braxton Hicks. Movement: He's still a very active little boy in there. He is most active in the evenings starting around 7:30 or 8 and lasting for a few hours. Cravings/Aversions: Nothing specific. I have been eyeing sweets a lot more lately. Sweets were my go to craving during my entire pregnancy with Charlie Beth (which is probably why I failed that one hour glucose test with her...). Sleep: No complaints. I have to turn from one side, to the middle (propped up on my back) and back to my other side multiple times throughout the night. I start aching pretty bad if I stay in one position for too long. 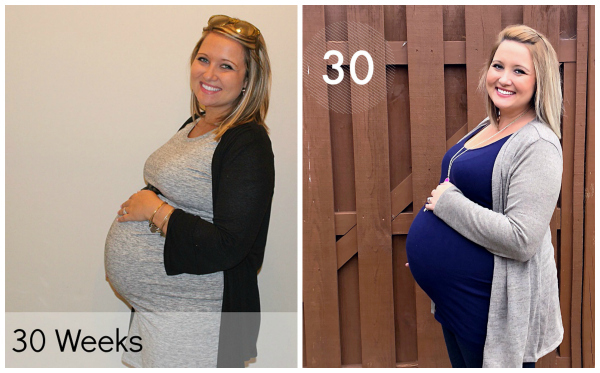 Maternity Clothes: Yep. Leggings and tanks with oversized cardigans are my go to right now. Nursery: Santa brought me all the furnishings and decorations that I need for Tucker's nursery. I have to finish painting the dresser/changing table and then I'll start on the fun part. I'm eager to get it finished! Best moment this week: Christmas with Charlie Beth. Christmas was so much more fun this year watching it through her eyes. She is obsessed with Santa (or "HoHo" as she calls him) and loved all her gifts he brought her. We had a long, fun Christmas day filled with lots of family time, food, and presents. Looking forward to: Checking off all the to do items in anticipation for our baby boy's arrival! You look great! We took everything down too! It actually felt nice to get ready for the new year and all of the baby gear! You look great! I'm like 6 weeks behind you and up around 13 lbs. I don't eat a lot extra, mainly just when I don't feel good since the morning sickness stuck around. So I'm thinking this baby might end up being big like big sister since I packed on the pounds with her and didn't eat a lot extra either. I'm so anxious to start Violet's nursery but we still need to put up all of the decor at the new house. Hoping we get that done this weekend so that I can start on the nursery!